Two journalism students have been signed up to cover women’s football for a national newspaper. 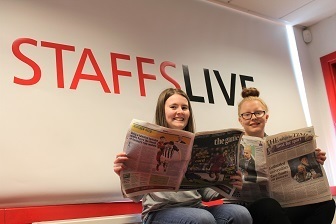 Staffordshire University sports journalism students Molly Hudson and Shauna Callan, both 19, will write for The Times over course of the FA Women’s Super League season. Molly and Shauna will travel to matches across the country and write for a regular feature in The Game, the paper’s weekly football supplement. Molly will also cover the Women’s Super League Cup final, between Arsenal and Manchester City, which is being held in High Wycombe today (14 March). A keen footballer herself, she is sacrificing playing in the match which could see Staffordshire University women’s team get promoted to attend the Cup final. Molly, from Peterborough, said: “It’s a really good experience for me to cover my first final in the women’s game. Doing this is the proof that I’m getting somewhere. The pair are the only females in their year and were put forward for the job by lecturer and journalist Ian Whittell. “Shaun, from Telford, said: “It is a bit surreal – you don’t think in your second year of university that you are going to write for The Times. It’s nice for me and Molly to be involved in women’s sport. Great stuff, well done to them both.